You can use the Zoom desktop client and mobile to change some settings without logging in to the Zoom web portal. 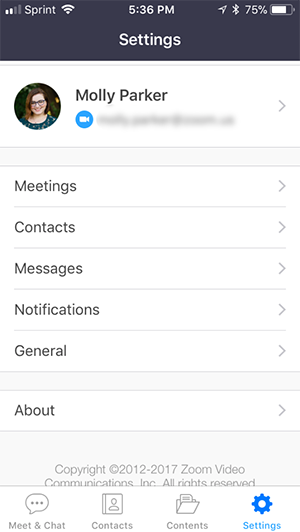 Change settings related to joining or starting a meeting. Start Zoom when I start Windows: Open and display the Zoom client when Windows starts. Silently start Zoom when I start Windows: Open the Zoom client when Windows start, but keep it minimized in the taskbar. When closed, minimize window to notification area instead of task bar: Keep Zoom open in the taskbar notifications area when you close Zoom. Confirm with me when I leave a meeting: Display a prompt to confirm if you want to leave the meeting after clicking Leave Meeting. Show my connected time: Display the total time you have been in the current meeting. Learn more. Remind me __ minutes before my upcoming meetings: Display a notification at the specified time before your meetings start. Use dual monitors: Place screen share content and video on separate screens while in a meeting. Use Zoom to appear on both monitors. Learn more. Maximize Zoom window automatically when viewing screen shared by others: Maximize the size of the Zoom client, but does not enter full-screen mode. Scale to fit my Zoom window when viewing screen shared by others: Automatically scale the shared screen to fit the size of the Zoom window. Enable the remote control of all applications: Allow other participants to remotely control all applications during a remote control session. Share Zoom windows in desktop sharing: Display the Zoom client to other participants when you share your screen. By default, the Zoom client is hidden when you share your screen. Side-by-Side Mode: Display the shared screen and participants' video side by side. Learn more. Limit your screen share to __ frames-per-second: Limit the frame rate of screen shares. View Advanced Features: Open the Zoom web portal to adjust settings not available in the Zoom client. View your video feed and change your camera. Camera: Select the camera you want Zoom to use. Video ratio: Select 16:9 (Widescreen) or Original Ratio (usually a 4:3 aspect ratio). Enable HD: Use HD video in your meetings. Enable mirror effect: Horizontally flip your video. This option is useful if your camera flips your video by default. Enable hardware acceleration: Use your computer's hardware to improve the performance of Zoom. Touch up my appearance: Apply a softening effect to skin to minimize the visibility of imperfections. Learn more. Always Display participants name on their video: Display participant's name overlayed on their video. Turn off my video when joining a meeting: Automatically disable your video when joining a meeting. Hide Non-Video Participants - Hide participants' thumbnail if they don't have video enabled. Thumbnails for non-video participants display their name. Spotlight my video when I speak: Place your video as the primary active speaker on your own screen when you speak. Learn more. Set your microphone and speaker, test them, adjust their volume, and change other settings. Speaker: Click Test Speaker to play a test tone. Click the drop-down menu to select the speaker you want Zoom to use. Microphone: Click Test Mic to record audio and play it back. Click the drop-down to select the mic you want Zoom to use. Automatically adjust microphone: Automatically make your microphone softer or louder as needed to normalize the volume and make it easier for other participants to hear you. If you are having issues with your audio fading in and out, you may want to turn this setting off. Use separate audio device to play ringtone: Select a another device that will play the ringtone when you are invited to a Zoom meeting or receive a Zoom Phone call. This device will ring simultaneously with your selected speaker. Automatically join audio by computer when joining a meeting: Automatically join meetings with computer audio, instead of displaying a prompt to join. Enable Stereo: Send audio in stereo if you have a mic that supports stereo audio. Read more. Allow option for using original sound from microphone in a meeting: Turn off Zoom's automatic adjustments designed to improve microphone quality, such as echo cancellation. If you have a microphone that applies these adjustments, you may want to turn this option off. Press and hold SPACE key to temporarily unmute yourself: If you are muted in a meeting, allows you to unmute by pressing and holding the SPACE bar. Sync buttons on headset: Allows the mute/mute function to be synced from your audio device to the Zoom desktop client. In other words, if you mute or unmute using a button on your audio device, the Zoom client will show your mic is muted or unmuted. Only enable this setting if you using a supported audio device. Displays information relating to Zoom Phone if you have a Zoom Phone license. Learn more. Direct number: Displays any direct numbers assigned to you. Company number: Displays the main company number and your extension number. Local calling: Displays the country code used for local calling. Area code: Displays the area code used for local calling. Adjust settings related to Zoom chat, channel, and message notifications. Show Code Snippet button: Display the code snippet button on the chat box, allowing you to send code snippets. Learn more. Include Link Preview: Insert a link preview with the page title, preview image, and description whenever your message contains a link. Show my status as Away when I am inactive for _ minutes: Change your status to Away if your computer is inactive for the specified amount of minutes. Left side bar theme: Change the color of the chat sidebar. Blocked users: Click Manage blocked users to view contacts you have blocked and remove them from the blocked list. Keep all unread messages on top: Keep chats with unread messages to the top of your chats list. Show unread message badge for channels: Display the number of unread messages beside each chat. Only private messages and mentions: Show notifications for private 1-on-1 chats and any time someone uses @(your name) in any channel (group chat). Receive notifications for: Set keywords you want to receive notifications for. With exceptions for: Set exceptions if you want specific channels to have different notification settings than the one your set above. Do not disturb from __ to __ : Set the time period when you do not want to receive notifications. You can select a virtual background, select the color of the background (green screen) behind you, and upload a virtual background image. Learn more. Select the location for your local recordings and view how much cloud recording space you have and how much is in use. Location: Choose the default location to save recording files. Choose a location for recorded files when meeting ends: When a recorded meeting ends, display a prompt asking where to save the recording files. If this is not enabled, recording files will be saved in the default location. Record a separate audio file for each participant who speaks: Creates separate audio files for each participant, instead of one audio file with all participants' audio. Optimize for 3rd party video editor: Ensure that the recording file is compatible with video editing software. Add a timestamp to the recording: Embed the date and time while recording the meeting. Record video during screen sharing: Continue to record participant's video during screen share sessions. Place video next to the shared screen in the recording: When recording during a screen share sessions, place participants' video and shared screen side-by-side in the recording. Learn more about local recording. Click Manage my cloud recording to open the Zoom web portal and adjust settings for cloud recording. View Advanced Features: Open the Zoom web portal to adjust settings not available in the client. Edit My Profile: Open the Zoom web portal to change personal information like you profile picture and name. Change My Subscription: Open the Zoom web portal and display your current paid plan and options to change it. Shows how much CPU and memory Zoom is currently using. If you are in a meeting, it will show data like latency and jitter so you can evaluate your audio and video quality. Send Feedback to Zoom, including ideas, requests or general comments. You can change the font size for closed caption and view keyboard shortcuts you can use with Zoom. Closed Caption Font Size - Click and drag slider to make closed captions smaller or larger. Always show meeting controls: Make the meeting controls visible at all times. If disabled, meeting controls will hide if your mouse pointer is inactive for a few seconds. Keyboard Shortcuts: Displays keyboard shortcuts you can use with Zoom. Maximize Zoom window automatically when a participant shares their screen: Maximize the size of the Zoom client, but does not enter full-screen mode. Scale to fit shared content to Zoom window: Automatically scale the shared screen to fit the size of the Zoom window. Share Zoom windows during screen share: Display the Zoom client to other participants when you share your screen. By default, the Zoom client is hidden when you share your screen. Prompt a confirmation before leaving a meeting: Display a prompt to confirm if you want to leave the meeting after clicking Leave Meeting. Show my meeting duration: Display the total time you have been in the current meeting. Learn more. Select the camera you want Zoom to use. Join audio by computer when joining a meeting: Automatically join meetings with computer audio, instead of displaying a prompt to join. Bounce application icon when receiving a new message: Show a bounce animation for the Zoom icon when you receive a new message. Record a separate audio file for each participant: Creates separate audio files for each participant, instead of one audio file with all participants' audio. Click Manage to open the Zoom web portal and adjust settings for cloud recording. Closed Captioning: Click and drag slider to make closed captions smaller or larger. From the Zoom client home screen, click on Settings. When closed, minimize window to the notification area instead of the task bar: Keep Zoom open in the taskbar notifications area when you close Zoom. Grab remote control automatically when controller idle for __ seconds: If you request remote control and the other participant accepts, the remote control session will automatically start if you are idle after the specified amount of time. View your video feed and change the camera. Touch up my appearance: Applies a softening effect to skin to minimize the visibility of imperfections. Learn more. Store my recording at: Choose the default location to save recording files. View Advanced Features: Opens the Zoom web portal to adjust settings not available in the client. Edit My Profile: Opens the Zoom web portal to change personal information like you profile picture and name. Change My Subscription: Opens the Zoom web portal and display your current paid plan and options to change it. Always show meeting controls: Makes the meeting controls visible at all times. If disabled, meeting controls will hide if your mouse pointer is inactive for a few seconds. Show offline contacts: Show offline contacts in the chat window. Show floating notification when I receive a chat message: Display a notification bubble for a few seconds after you receive a message. To access settings, click the Settings (gear) icon. Click on your name and email address to edit some basic profile settings or sign out from the Zoom app. Profile Photo: Use your phone's camera to take a new profile photo, or upload a photo from your phone. Screen Name: Edit your name used in Zoom. Sign-in Password: Change your password. Personal Note: Enter a personal note that's displayed to other users. Personal Meeting ID (PMI): Change your personal meeting ID (requires a Pro license). Personal Link Name: Set or change your personal link name (requires being part of a Business or Education account and having a pro license). Default Call-In Country - Set the default country for the dial-in phone numbers in your meeting invitations. Phone Contacts Matching: Find contacts in your phone that also have a Zoom account and adds them to your Zoom contacts directory. Contact Requests: View sent or received contact requests. Automatically Call My Number: Automatically call your phone number when joining a meeting, instead of connecting using device audio. Always Mute My Microphone: Always mute my microphone when joining a meeting. You can unmute if the host allows. Always Turn Off My Video: Always turn off my video when joining a meeting. You will be able to start your video after joining the meeting. Closed Captioning: Zoom will display closed captions when available. Show My Connected Time: Display the total time you have been in the current meeting. Driving Mode: Allows you to swipe right while in a meeting to enter safe driving mode. You will need to tap to speak and your video will be off. With exceptions for groups: Set exceptions if you want specific channels to have different notification settings than the one your set above. Keep all unread messages on top: Move chats with unread messages to the top of your chats list. Receive notifications for keywords: Set keywords you want to receive notifications for. Do Not Disturb: Temporarily turn notifications off for this device or set the time period when you do not want to receive notifications. Always, even if I am active on desktop: Always receive notifications on your phone even if you are active on the desktop client. Only when I am not active on desktop: Only receive notification on your phone if you are inactive on the desktop client. 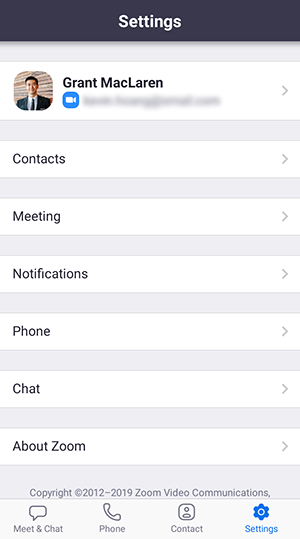 Message Notifications Settings: Open your phone's notification settings to adjust options for the Zoom mobile app. Tell Others About Zoom: Send an email or message to invite others to use Zoom. Rate Zoom in the App Store: Open the App Store to rate Zoom. Always Show Meeting Controls: Always show the meetings at the bottom of screen during a meeting. Synced Calendars: Check calendars for Zoom meetings and add them to your upcoming meetings in the Zoom app. Meeting Reminder: Display a reminder for upcoming meetings. Closed Captioning: Display closed captions when available. Touch Up Appearance: Apply a softening effect to skin to minimize the visibility of imperfections. Learn more. Keep Virtual Background For: If you are using a virtual background, select to use it for the current meeting only or for all meetings. In-App Alert-Sound: Play a sound when a notification is displayed. Blur snapshot on task switcher: Blurs the preview of the Zoom app when using the task switcher. Use this setting to hide sensitive information when using the task switcher. Integrated Calling: Integrate Zoom with your phone's lock screen and contact list. You will be able to answers calls from the lock screen and make Zoom calls from the contact list.